THE best part of living in Bahrain is the gorgeous weather despite the moans of some expats about the sizzling summer sun. It also offers us the opportunity to be well dressed for all sorts of outside activities, particularly in the cooler period we are now enjoying, whether it’s a breezy sail on the open water, a walk along one of the five star hotel beaches, a game of tennis at the Dilly or a day playing the challenging Montgomerie course at the Royal Golf Club. 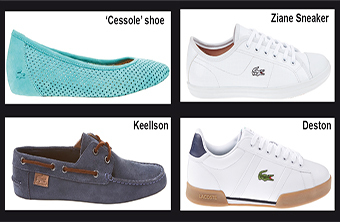 With the launch of Lacoste’s Spring/Summer 2015 footwear collection you will be nicely covered because it ties all these beautiful things together in three imaginative collections. ‘Urban-Sail & Sea’ takes on from ‘city to sea’ and combines a nautical-style and function, adapted for a contemporary lifestyle. Inspired by the timeless elegance of sporting holidays on the Riviera where Lacoste first became ‘De Rigueur’ (required by etiquette or current fashion) for the crowd. This easy-to-wear footwear blends sport and style to offer the ultimate in modern casualwear on deck or in the city. For the Gents: Keellson – This modern boat shoe is a light and effortless reimagining of a cult classic. Supple burnished leather and piqué texture around the foxing, referencing the iconic polo. The ‘Clean Lines’ collection is a reinvention of a classic court shoe taken ‘off-court’ and gives a nod to Rene Lacoste’s prestigious heritage. The modern clean lines with this collection are on trend with today’s minimalist style. For the Gents: The Deston- This court classic showcases traditional gum soles and clean white uppers which offer vintage tennis aesthetic while the green oversized croc logo gives that vintage appeal. ‘Crafted Silhouettes’ line embraces golf-inspired designs paired with streamlined aesthetics and timeless elegance. The consummate style for a casual lifestyle, this shoe merges golf-inspired design with a streamlined aesthetic. Subtle earth tones lend the evergreen Oxford shape a trendy timelessness. This premium summer sandal with sport-inspired designs uses bold colour blocking by the combination of contrasting materials. This gladiator sandal would be a perfect fit for any casual summertime event.